Dauphin Island is located directly south of Mobile, Alabama, more than 110 kilometers east of the region where the eye of Katrina came ashore in Plaquemines Parish, LA. The island suffered extensive overwash, and a major breach was formed toward the western end of the island (not shown). Below, photo triplets show the changes that have occurred in the recent hurricane seasons to a developed section of the island. The time period covers Hurricanes Lili (2002), Ivan (2004), Dennis (2005), and Katrina (2005). 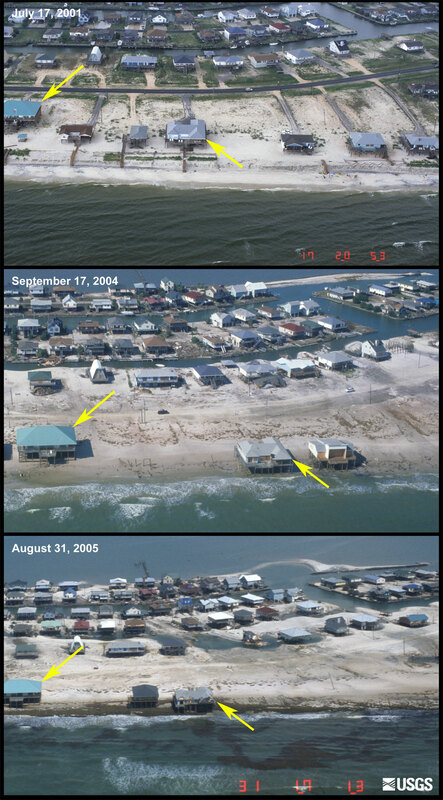 The first image in each triplet was taken in July 2001, before Hurricane Lili (2002). The second photograph was taken on September 17, 2004, immediately after the passage of Hurricane Ivan. The third image in each triplet was acquired on August 31, 2005, two days after Hurricane Katrina. 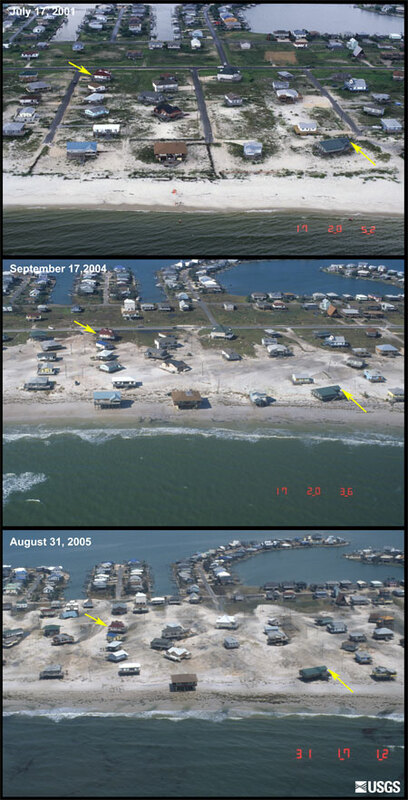 All triplets show that the changes due to Hurricane Dennis (2005) and Hurricane Katrina are much greater than the changes from Hurricanes Lili and Ivan. Photo showing locations of pre-and post-storm photo sets. Scroll down or click on the yellow location numbers on the photo above to view the pre- and post-storm photo sets for Dauphin Island.